Located on the eastern end of Long Island, at the tip of the South Fork, Montauk is home to beautiful beaches, world-class sport fishing and excellent surfing. No longer sleepy, Montauk has changed a lot in the last few years with the opening of new hotels, restaurants and late night hot spots. Yet, it still remains more authentic than the rest of the Hamptons. Our friends, Jamie and Steven, have been spending summer weekends together in Montauk for years, and here Jamie shares her favorite spots with DT365 for a perfect summer day. There's a SoulCycle in the old movie theatre if you're feeling sporty. Want to go paddle boarding? Head to Fort Pond by The Puff and Putt miniature golf. You can rent paddle boards, kayaks and sail boats there. Another good place to rent longboards, paddle-boards and bicycles is at Air and Speed Surf Shop. They also offer surfing lessons. Have a house and want to stay in? Stock up at the butcher section at Herb’s, a Montauk classic that’s been around forever—or forget cooking and get their fried chicken and a bunch of homemade sides to go with it! Morning: Start your day in the sand at Ditch Plains Beach. 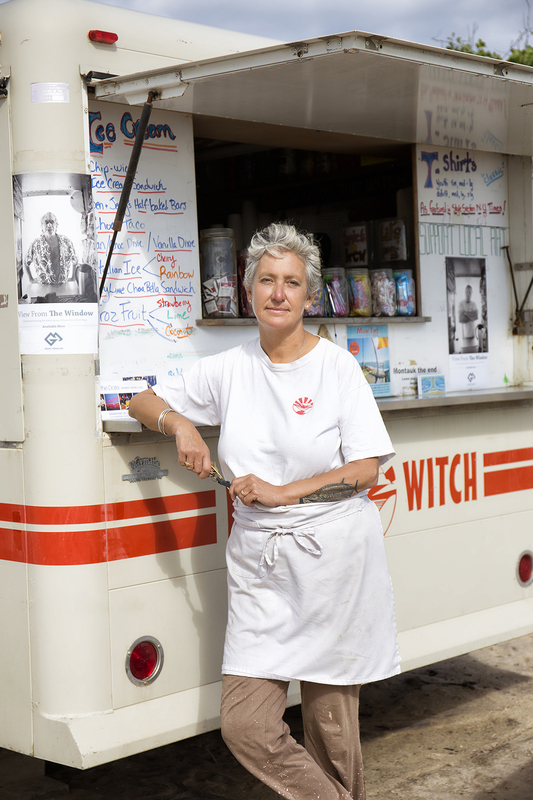 Grab a coffee from the Ditch Witch and watch the morning surfers. After, try a class at Love, my favorite yoga studio or just head to Naturally Good for their scrambled tofu wrap. Make sure to get extra fresh salsa. (They also have great juices and smoothies.) Sit in the back garden at the picnic tables and chill. Next-door to Love Yoga is a new micro brew coffee shop called Left Hand if you need another morning fix. Other Spots: We also like Goldberg's for amazing bagels and lox, and Joni’s for healthy breakfast wraps and smoothies. (Cash only.) Happy Bowl's on 27 has delicious Acai bowls, or pick up some cold pressed, organic juice at Montauk Juice Factory. Be prepared to wait on line everywhere you go. Town: Not much to do in town except walk around and look at the local T-shirt stores. My favorite is called Local Knit. Nate is the sales guy there and he's sweet and chill. (If you want to really shop, brave the traffic on 27 and head to Amagansett, East Hampton, or Sag Harbor.) There's a great small spa called Deborah Thompson Day Spa in the middle of town. Don’t miss the grape stem facial with either Deborah or Amy; it may be the best I've ever had. Sun and Sand: The beach at Kirk Beach by the IGA supermarket is really nice. You can park almost anywhere and there's no hassle. Or head back to Ditch Plains, my favorite beach. Ditch reminds me so much of my life in Manhattan Beach, all the people have known each other forever and chat like family. Seafood Lunch: Both the Topside or Inlet Cafe at Gosman's Dock are phenomenal. The raw bar is maybe the best around. Look for Little Linda who is sometimes the bartender and sometimes the waitress. Grab a bloody Mary and hang out for a while and watch the boats come in and out. Even if you're not cooking dinner at home, treat yourself to a walk through Gosman's market--all the pies are fresh baked, the produce is locally grown and the fish is right off the boat! And the lobster salad is the best ever! Buy a pound and some hot dog buns and you’ve got DIY lobster rolls. Hopping Lunch: Then there's Navy Beach, if you’re looking for more of a scene. Martine is the Maître d’, he's a cute roly- poly guy with a tiny little curly ponytail. Sit in the back on the beanbags and listen to the live music. Sunset Aperitifs: For drinks before dinner head to the Crow's Nest. It's right off 27 on the way to the lighthouse. There's a boat in front and it's right on Old West Lake Drive. Go down past the restaurant to the small beach, sprawl on a lounge and have some rosé. It’s one of my favorite summer places! Other sunset spots are: The Inlet, The Montauket, Navy Beach, and Duryea's Lobster Deck. Dinner: New this season, we’re digging the small plates and delicious cocktails at Flagship, from father-and-son team Eric and Adam Miller. One of my favorite restaurants is South Edison right in town. They have some of the best food in Montauk, everything from seafood to steak. It’s low key and delicious. For those who just love eating with an ocean view check out Scarpetta or Tillie’s at Gurneys. On our list to try is Arbor and Grey Lady. Late Night: If you're up for some nightlife, there are plenty of choices. The Surf Lodge attracts a great looking, young crowd and has live music concerts every weekend. Ruschmeyer's is another extremely popular spot; have a drink on the lawn under the lights and you’ll be transported back to summer days at camp. Sweets: For a late night treat stop by Buddha Berry for frozen yogurt. The flavors are crazy and they offer more toppings than you could ever imagine. They also have a small sitting area out back, kick back and look up at the stars. Stay: The big news has been the remodeling of Gurneys. It’s the most resort like hotel in the Hamptons, on a beautiful stretch of beach. Make sure to book one of the renovated rooms, as not all have been redone. The Montauk Yacht Club was also recently renovated, with many different room options. I’d suggest one of the bungalows, with decks overlooking the marina. The Montauk House is a boutique hotel right in town, a block from the ocean. Halfway between Amagansett and Montauk, White Sands, right off route 27 is simple, laid back, clean and quiet. And it’s right on the ocean—location, location, location. Plus More: Our friend Amanda Russo Rubman just got back from a few days of Montauk R and R and shared these highlights from her stay. “We hiked at Camp Hero. There are multiple hiking trails, with picnic benches along the way, why not pack a picnic lunch? If you’re looking for a real journey, you can continue hiking to the Montauk Lighthouse. Fashionistas will enjoy the Leiber Museum, located on Judith Leiber’s property. (Check ahead as it’s only open a few days a week for a couple of hours.) You enter into a whimsical garden filled with bold sculptures, think Storm King on a much smaller scale. Inside the structure are thousands of Judith Leiber handbags and accessories, curated from her collection and private collectors. Post beach or for pre-dinner cocktails check out Lynn's Hula Hut. You may even find Lynn behind the bar. * Special thanks to Car Pelleteri for her beautiful photographs.